In the latest issue of Famitsu Weekly, a new interview with Tetsuya Nomura has been included. Nomura comments about Birth by Sleep Volume 2 and the newly released scenes from Kingdom Hearts ReCoded, which links to Kingdom Hearts χ and Kingdom Hearts Dream Drop Distance. The following translation has been provided by SkyKeybladeHero from KH13. What are the highlights of KHIIFM HD? 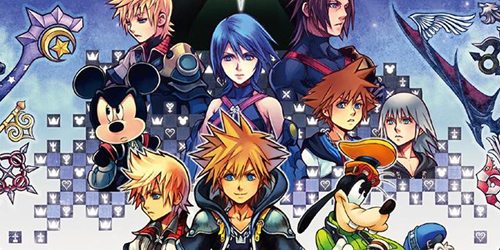 Nomura: KHII’s map and production have much more density than KH, and the characters are more numerous as well. In HD, you can see well even the expressions of characters that are in the background and understand the circumstances with more ease. Since KHII has much more information, I think it greatly benefits from the HD remaster. Among everything that was included in the Final Mix version, what would you recommend? Nomura: The battle against the Lingering Will. Among all the series’ titles, it stands for 1st or 2nd most famous battle. It’s quite hard to defeat it, but even if you don’t, I want everyone to taste its power. Depending on whether you fought it or not, I think your feelings for BbS will change. In 2.5, BbS is also included, so I’d recommend playing KHII and fighting the Lingering Will first, before going on to play BbS. What are the highlights of KH BbS FM HD? Nomura: Comparing to KHIIFM, which we could almost leave as it was, the production of BBS HD was much more major, since it was originally designed for a handheld. The amazing part is feeling it in a way you’ve never seen before, I guess. Story-wise, it has 3 characters and many shocking scenes, so you can’t just squeeze it in one story. I daresay the Secret Movie is one of those shocking scenes. Among the whole series, I think it’s one of the most touching, so I hope you enjoy watching it in HD. Nomura: The Secret Episode. It’s an evolution of all the Secret Movies I’ve put in the games so far, because it’s playable. You can feel the pace of the story and the battle, so I’m glad I made it like that. By the way, the indication for Birth By Sleep -Volume 2- is still there. It shows the existence of Aqua’s story in the Realm of Darkness. It means that she didn’t just wander about in the Darkness for ten years, but that she passed through many experiences. However, it is a “Fragmentary Passage”, as the same suggests– that story was severed and wasn’t told. I hope I can tell it when given the opportunity. What are the highlights of KH Re:coded HD? Nomura: Everything! The original text dialogues were changed to fit being voiced, and the feel you get from it has changed a lot. For example, in Alice’s world, the texts that ended in “right?” were changed to “riiiight?” in the voice acting. We used the production of original anime as basis for this. And it is a title full of discoveries. Also, I tried to make it a feature film that links the story very well when adding the Disney Worlds, battle scenes and narrations. Tell us more about the new scenes. Nomura: I’ve added 2 brand new scenes. One of them contains the word “Tome of Prophecy” which is related to KHχ as well. Currently, there are many people that seem to think KHχ isn’t canon, so I intended to make people realize that indeed there is a connection, by adding some elements from KHχ in 2.5. The other scene is from KH3D, before Axel (Lea) and the others wake up. If I tell too much about it, I think many doubts will come forth, so I’ll leave it to your imagination.